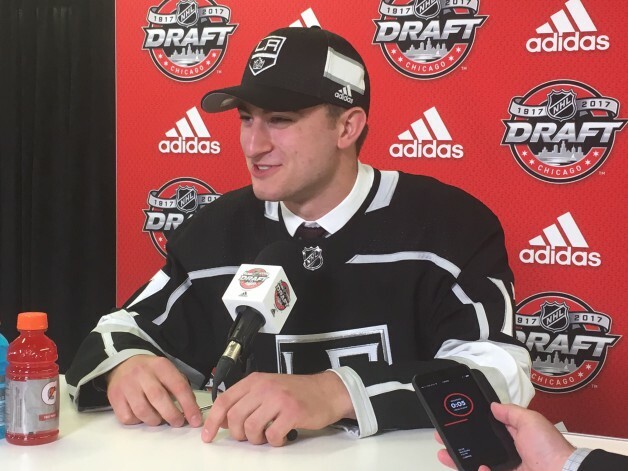 The three California teams and the expansion Vegas Golden Knights all showed well in selecting top-quality prospects at the 2017 NHL Draft June 23-24 at the United Center in Chicago. The Anaheim Ducks made five picks, while the LA Kings drafted seven players, the San Jose Sharks six and the Golden Knights stocked up with a dozen selections. 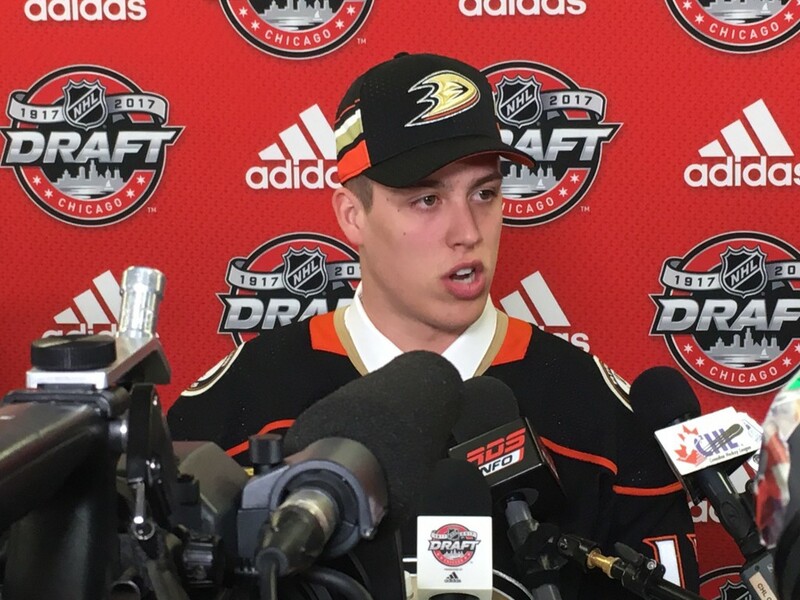 Anaheim took forward Maxime Comtois (pictured below) from the Victoriaville Tigres of the Quebec Major Junior Hockey League (QMJHL) with the 50th overall pick in the second round. Ten picks later, the Ducks drafted center Antoine Morand from the Acadie-Bathurst Titan (QMJHL). With the 91st overall selection in the third round, the Ducks chose forward Jack Badini from the Clark Cup champion Chicago Steel of the United States Hockey League (USHL), then forward Kyle Olson (Western Hockey League’s Tri-City Americans) in the fourth round (122nd overall) and Swedish goaltender Olle Eriksson Ek 153rd overall in the fifth round. Gabe Vilardi (pictured top) won a MasterCard Memorial Cup in May with the Ontario Hockey League’s (OHL) Windsor Spitfires and was taken by the Kings in the first round (11th overall). The Kings opened Day 2 of the draft by selecting forward Jaret Anderson-Dolan from the Spokane Chiefs of the WHL in the second round (41st overall) and then went with Sault Ste. Marie Greyhounds (OHL) goaltender Matt Villalta in the third round (72nd overall), defenseman Michael Anderson (USHL’s Waterloo Black Hawks) in the fourth round (103rd overall), defenseman Markus Phillips (OHL’s Owen Sound Attack) in the fourth round (118th overall), defenseman Cole Hults (USHL’s Madison Capitols) in the fifth round (134th overall) and forward Drake Rymsha (OHL’s Sarnia Sting) 138th overall in the fifth round. San Jose grabbed a pair of California natives – Orange native Jake McGrew (Spokane, sixth round, 159th overall) and Huntington Beach native Sasha Chmelevski (OHL’s Ottawa 67’s, sixth round, 185th overall) and a pair of players from the U.S. National Team Development Program in forward Josh Norris (first round, 19th overall, pictured below) and forward Scott Reedy (fourth round, 102nd overall). 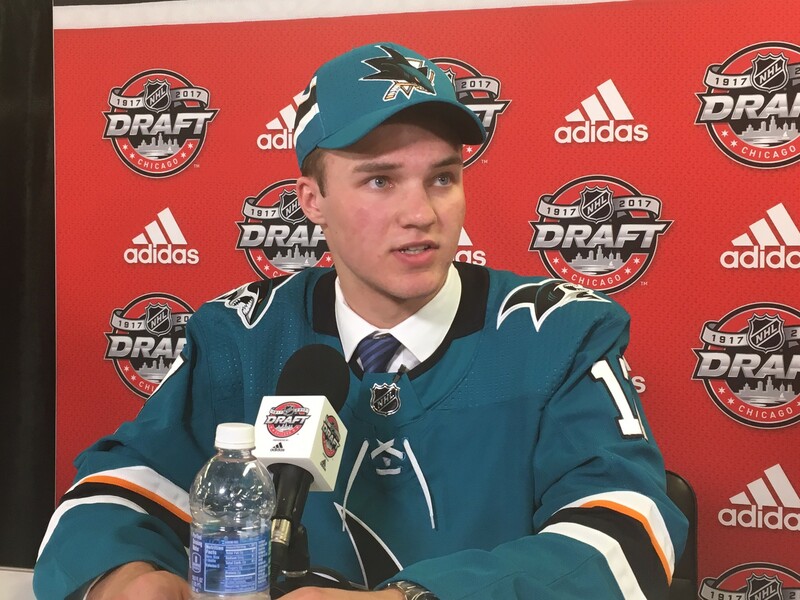 The Sharks also took defenseman Mario Ferraro (USHL’s Des Moines Buccaneers) in the second round (49th overall) and forward Ivan Chekhovich in the seventh round (212th overall). 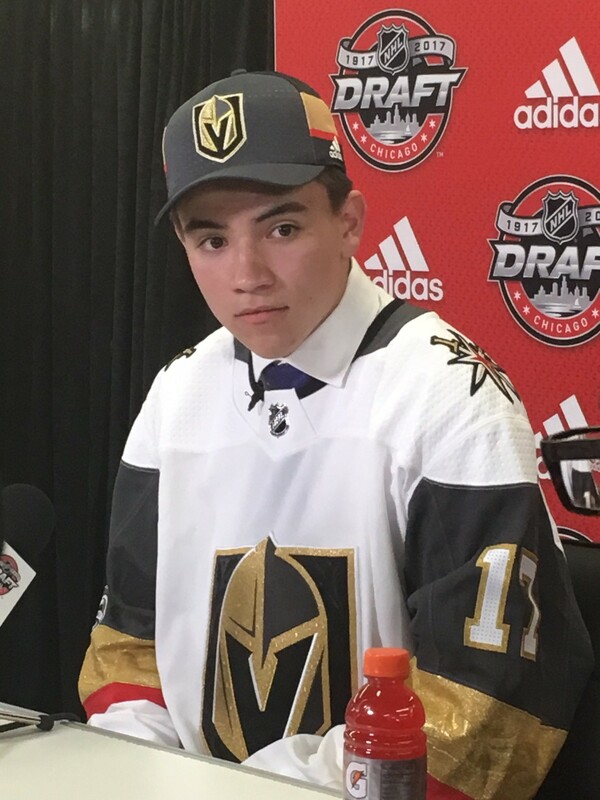 For Vegas, the Golden Knights added Portland Winterhawks (WHL) forward Cody Glass (sixth overall), Owen Sound forward Nick Suzuki (13th overall, pictured below) and Swedish defenseman Erik Brannstrom (15th overall) in the first round, Mississauga Steelheads (OHL) defenseman Nicolas Hague (34th overall) and Regina Pats (WHL) forward Jake Leschyshyn (62nd overall) in the second round, Swedish forward Jonas Rondbjerg in the third round (65th overall), Green Bay Gamblers (USHL) goalie Maksim Zhukov in the fourth round (96th overall), Swedish forward Lukas Elvenes (127th overall) and New York prep school forward Jonathan Dugan (142nd overall) in the fifth round, North York Rangers (Ontario Junior Hockey League) forward Nick Campoli (158th overall) and Czech goalie Jiri Patera (161st overall) in the sixth round and Niagara Ice Dogs (OHL) forward Ben Jones in the seventh round (189th overall).